Photos, slides and negatives are naturally afflicted with image defects. Even if photos and slides are handled very carefully, it's virtually impossible to avoid contact with dust particles; small scratches are also not uncommon. Greater defects on treasured images can be especially annoying, because they often hide important details or even destroy the overall image. These flaws do not often get recognized until scanning, because scanning means also increasing image size in most cases. SRDx is the most efficient solution for the elimination of all these flaws. How is SilverFast SRDx working? The algorithms used in SRDx for defect detection can recognize dust and scratches because their image information differs greatly from the surrounding area. Furthermore, the algorithm has been programmed to recognize typical scratch marks (elongate and narrow). Detected flaws can be removed by taking the surrounding image information into account. Other software solutions for removing dust and scratches usually use a focus blur, which deteriorates general image quality. Using the image processing software SilverFast HDR and HDR Studio and SRDx you can eliminate defects from previously scanned images (also RAW data). You can also load and optimize digital images, for example from a digital camera. Many options to adjust the SRDx tool with simultaneous visual checking offer a reliable technique for removing any defects without destroying image details. The expert mode (only in Ai Studio, HDR Studio and the Archive Suite) offers additional functionality, which helps to mark the defects to be corrected. 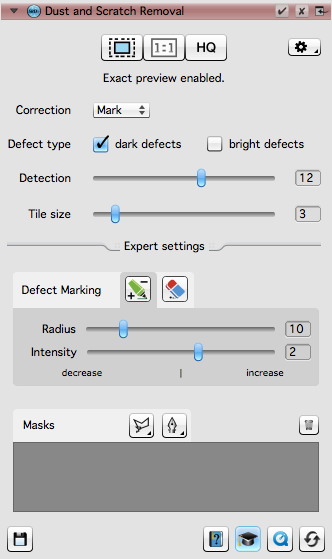 With the Marker Tool, the correction intensity of individual image details can be selectively decreased or increased. 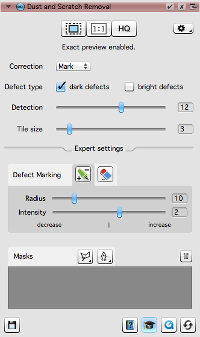 The Eraser Tool is used to specify image areas, where no correction should be applied at all. A special case regarding dust and scratch removal are black and white film and Kodachrome film. Unlike color slides or color negatives, the scanner's infrared rays can not permeate through the film emulsion, due to the silver halide layer contained in the film. This means that infrared based tools like iSRD, ICE1, FARE1 or MagicTouch1 can not be used here. SRDx has been developed especially for these cases. SRDx ensures an effective removal of dust and scratches even for B/W film and Kodachromes. Experience with our movies, why the upgrade to Ai Studio or HDR Studio is worth it and how easy it is to use the SRDx special tools! 1 All trademarks are the property of their respective owners. Read the full article on www.shutterbug.com.